By amazing chance we are back in Stratford again, but this time for the real opening ceremony. The atmosphere is already incredible. The world is in for a treat tonight. The plants I photographed on Monday are now in full bloom and as good as any flower show exhibit. 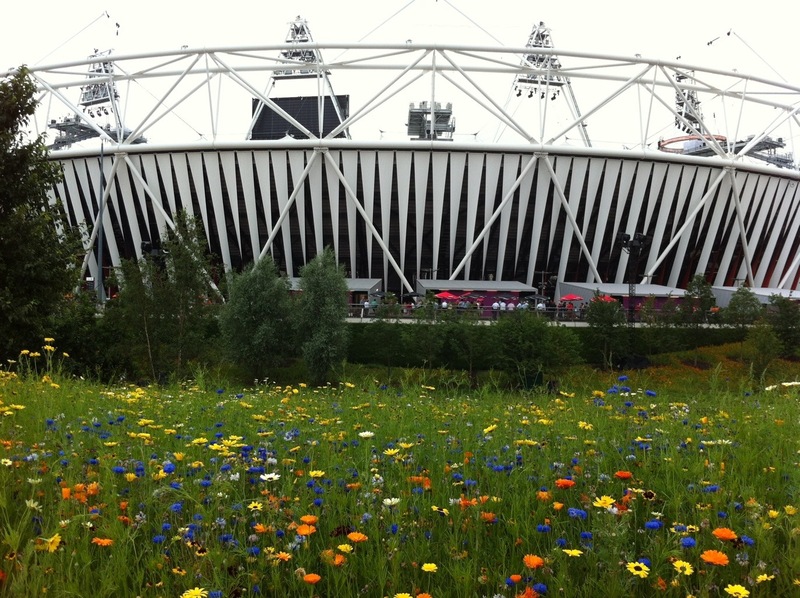 The stadium seems to float in a sea of wild flowers and silver birch trees. Lots of colourful pot marigolds (Calendula officinalis), pale yellow Dimorpotheca aurantiaca, chrysanthemums and cornflowers to lift the crowds’ spirits, not that we need much help with that! The Southern Hemisphere beds are alive with red hot pokers (both Kniphofia “Timothy” and Kniphofia rooperi), Helichrysum , Galtonia candicans, Dierama pulcherrimum and Tulbaghia violacea. The gorgeous wide red flowers in the foreground are Gladiolus papilio “Ruby”, a relatively new fully hardy Gladiolus hybridised from the South African species. It displays larger hooded blooms than the original bulb with rich ruby-red flowers in mid to late summer. 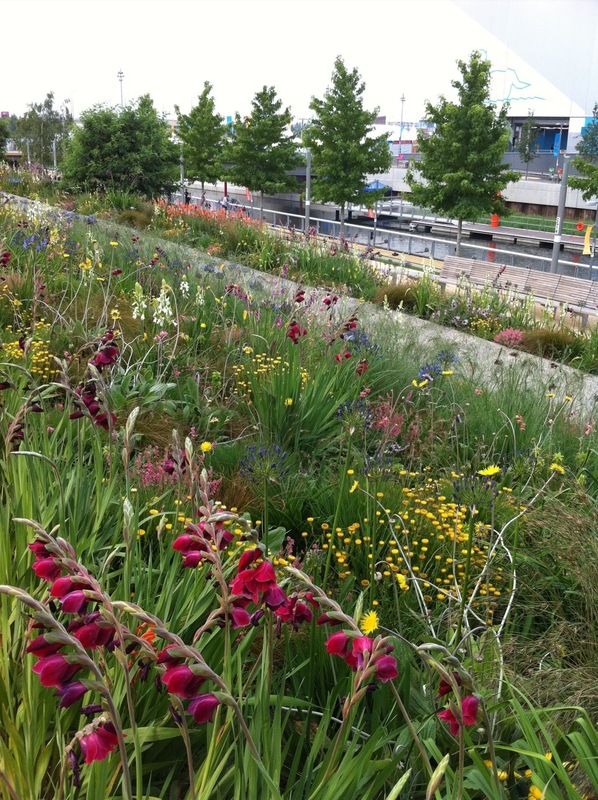 These borders which can be found all around the stadium, each based on a different type of flora, are just beautiful and a tribute to the rich biodiversity of the visiting nations. 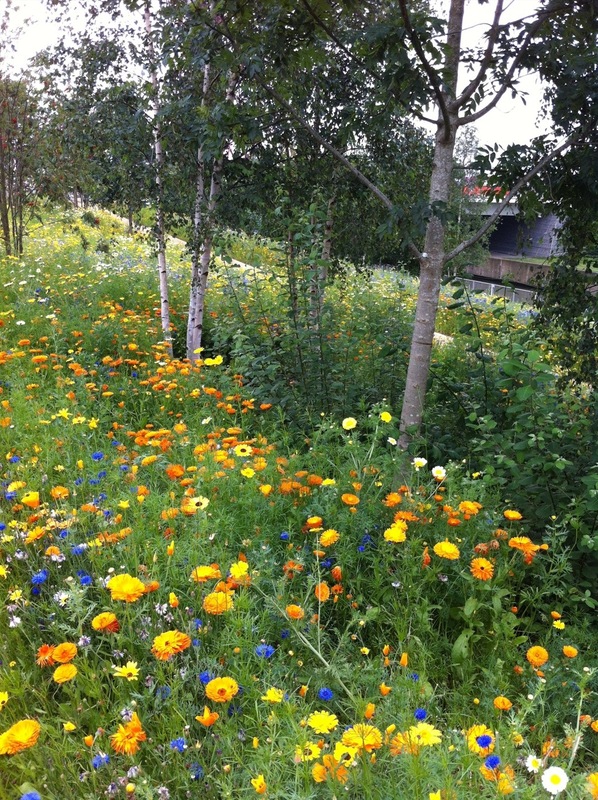 This is the first Olympic Park to really embrace its landscape, with large public meadows and river ecosystems within its boundaries. The open space will be a terrific legacy for this part of London. But today it’s all about The Games and the big show. Enjoy it wherever you are.